Thailand is strategically based at the heart of South East Asia and provides a wealth of opportunity for foreign investors. Since the Asian financial crisis of 1997, Thailand has bounced back as a vibrant and more diversified economy, resilient against the backdrop of an ever changing global landscape. Thailand is seeking to continually “move with times” and is embracing the changes taking place in the global trend towards a digital economy. Incentives to domestic and foreign investors in this field, are being granted. Thailand boasts a dynamic workforce that is competitive in the areas of cost and skills when compared to its peers. We at RSM welcome foreign investors to make investments in Thailand and to use Thailand as an integral part of their expansion plans in South East Asia. With over 150 staff in Thailand, we have helped numerous foreign investors set up business in Thailand. Our affiliation to RSM International also facilitates connections on a global scale. 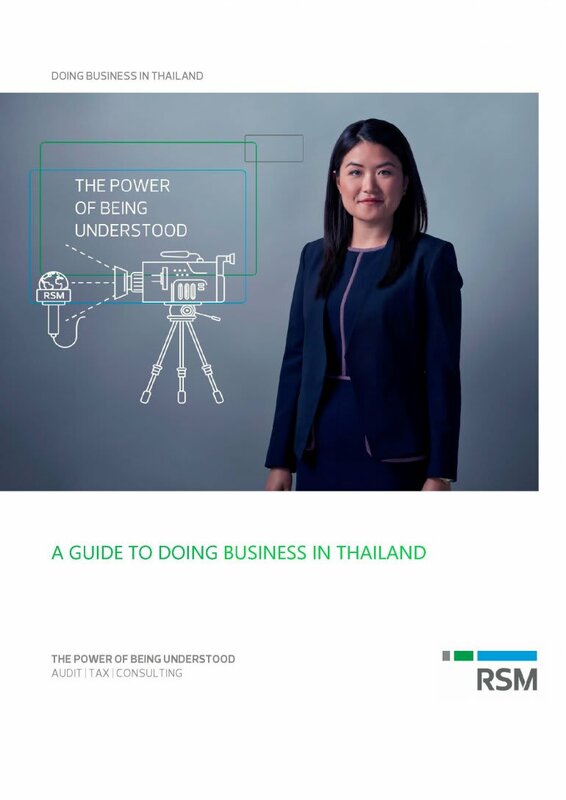 We hope this guide will provide the necessary insights into how you can make the best use of what Thailand can offer to investors. This guide is intended to provide an overview of issues to consider when investing and doing business in Thailand, and is for general information purposes only. Applicability of the information to specific situations should be determined through consultation with your advisors at RSM. Welcome to Thailand. We welcome the opportunity for you to come and talk to us.